Cover girl Tiffany is a full time student at Texas State University in San Marcos. She is working towards a BFA with a specialization in fibers and metalworking. Her work is inspired by the French rococo, drawing heavily on Marie Antoinette’s personal fashion, and the architecture of the palace of Versailles. 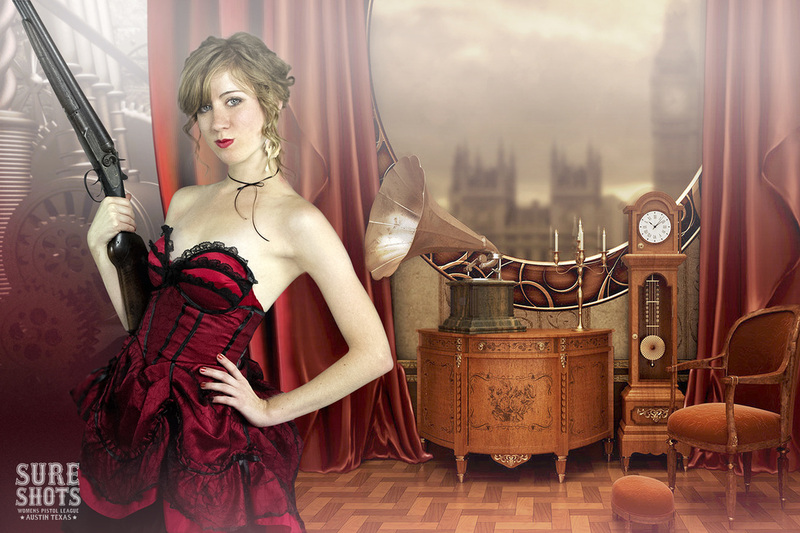 These influences are evident in the numerous corsets she has made from a variety of materials such as glass, metal, and paper. Additionally, the large-scale paper ball gown she created was recently featured at the Arts Council of Brazos Valley. 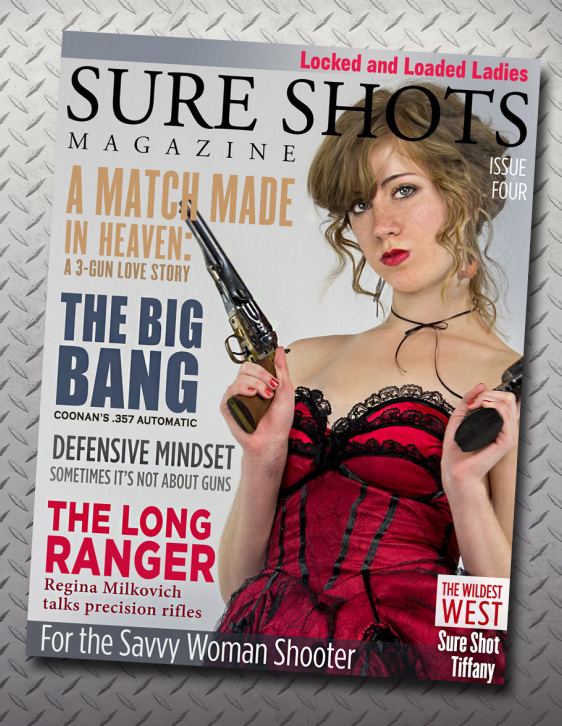 When we told her the theme for her cover shoot ("Victorian Steam Punk Wild West"), she designed and made the dress she is wearing, and it was even more amazing in real life! The modern black revolver is a Colt New Frontier .22 long rifle. The black powder revolver is a Navy Arms Company reproduction made by Auberti of Italy. It is 36 caliber. The shotgun is a L.C. 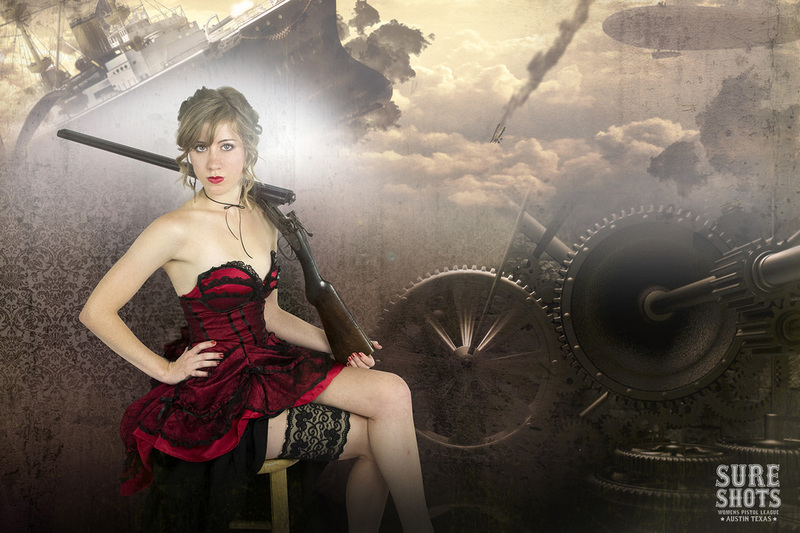 Smith double barrel antique hammer gun with barrels made from Damascus steel, most likely made prior to WWI..
Tiffany wears a Garter Holster by Femme Fatale.